DS Castlevania: Portrait of Ruin (USA) "all bosses" in 24:09.89 by mtbRc. 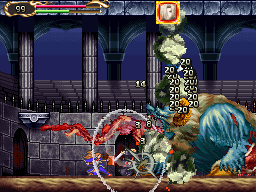 The second Castlevania title released on Nintendo DS after Dawn of Sorrow, this game is a direct sequel to Bloodlines on Sega Genesis. Dracula rises from the dead yet again (cue groan), and it's up to Jonathan Morris, helped out by Charlotte Aulin, a powerful mage student, to defeat him. Beating Dracula into a pile of dust in under five minutes wasn't enough for our heroes, so this time they wreck his entire castle and surrounding areas before killing him. Every boss is slain, so you get to see more of that fast "showtime" action. Significant glitching is used; read the author's comments for more information.